I know for most of us, much of this info is all pretty common knowledge, but I thought it might be fun/useful to have it all in one place with pictures of the “personal touches” the actors gave their characters. Please feel free to add missing info and/or backstories! 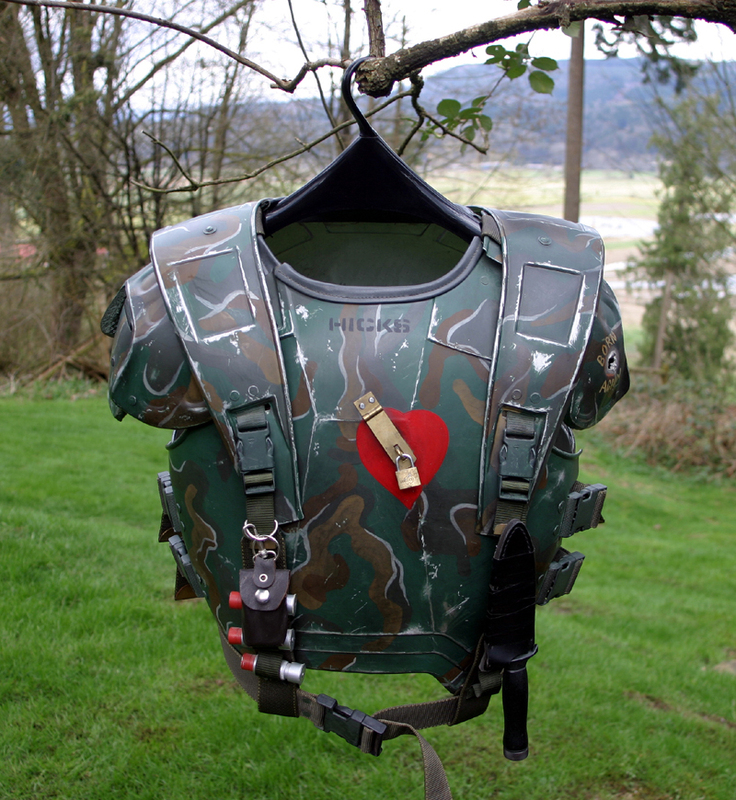 -Breastplate: “Heath” (short for “Heather”, his girlfriend at the time) inside a heart w/arrow. -Hat: “This END UP” in marker & some kind of bead/chicken bone necklace through brim. -Neck/weapon: Another beeded necklace with feathers/bones that is around his neck early, then tied around the barrel of the smartgun later. -n/a. The man was no-nonsense. -Nothing known by me. Anyone? 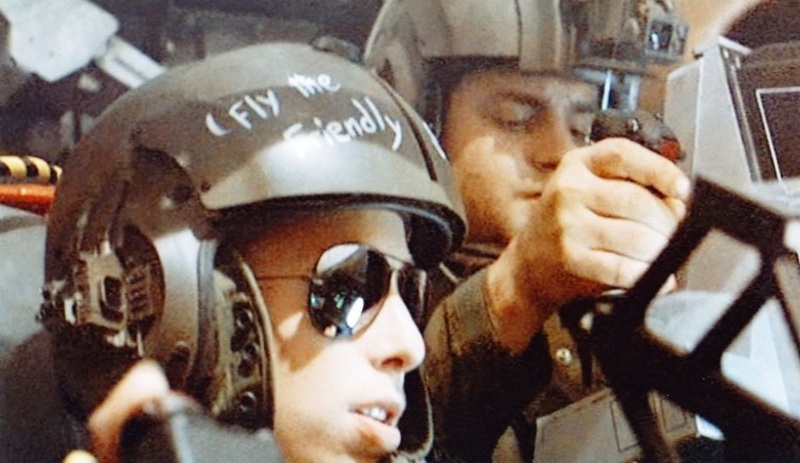 -Helmet: In black marker he has; an 8-ball drawing, his “game over” countdown, and “dead head” written on the helmet cover. 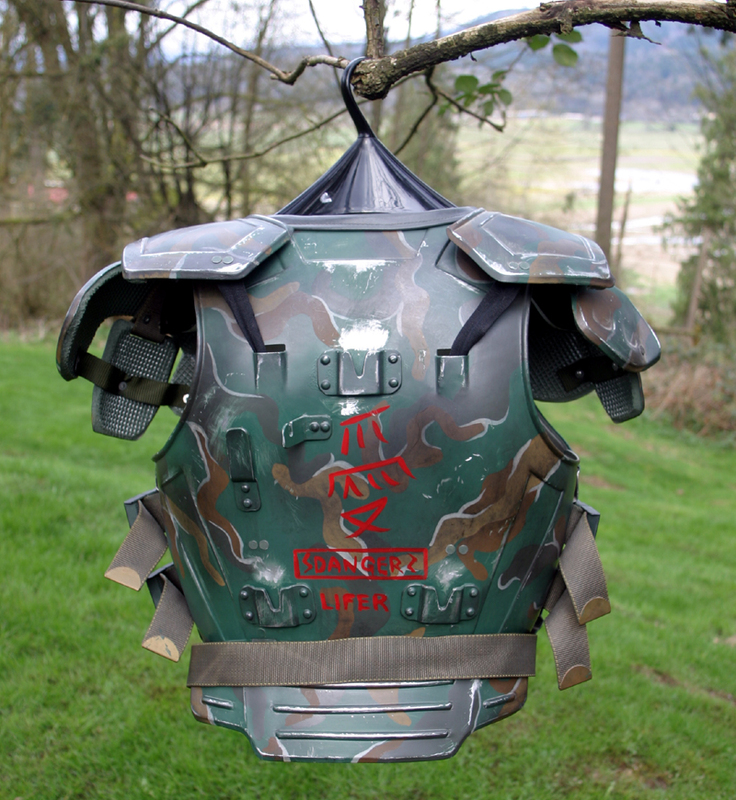 -Body Armor: Pretty iconic and well known stuff. *(I’ve heard the character translates to something about love. Also some reproductions show “Danger” “Lifer” on the back, although from this screen grab I don’t see it. If anyone knows that back story please fill in the gaps). I’m sure I’ve missed things. Especially with Hicks and Hudson this stuff is so common that I didn’t really dig very deep. I would appreciate and welcome anyone that has something to add. Be it a personal touch missed, a back story filled in, or even just a better picture. Thanks! Last edited by bigbisont on Fri Nov 25, 2016 10:55 pm, edited 4 times in total. I'd actually never seen Crowe's stuff or all of Drake's and Vasquez's. He wore a green cap at one stage, with 'Grunt Runt' written on the front. I believe he also has 'Death From Above' written on him somewhere. Don't forget Vasquez's teardrop tattoo under her eye ! 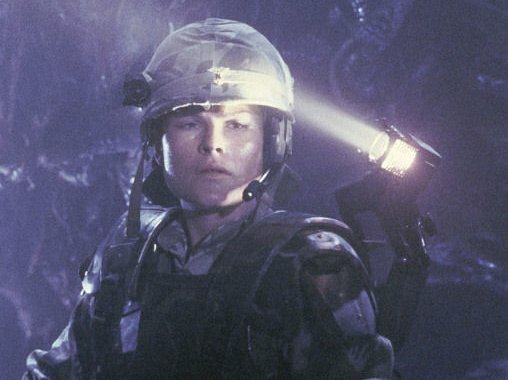 The "N" can bee seen in her promo pic (just before she gets jumped by the alien in the hive). There it is to the (picture's left) of his skull graffitti. These were readily available on ebay at one time. This thread can be great! Maybe should eventually be made a sticky. Also some reproductions show “Danger” “Lifer” on the back, although from this screen grab I don’t see it. "Lifer" (in white letters) can be seen between his lower armour attachment (braces?). Never heard a backstory from Michael Biehn (or James Remar ), but the simple answer is that a "Lifer" is someone who has no intention of quitting or retiring from (in this case) the Corps. They are in "for life." I've never seen "Danger" on his armour either. Last edited by SSgt Burton on Thu Dec 20, 2012 1:34 am, edited 1 time in total. This may cause further problems, but the US Army Nurse's Caduceus collar insignia comes in several different versions, depending on whether they were made pre, mid or post WW2, or even later, with the N in a number of different colours. Awesome to the max. And yes, now I see the white letters "lifer". I was half expecting it to appear in red like on the reproduction armor I had seen before (and Moosh later posted), but sure enough, there it is. Also the nurse pin and bolo knots are GREAT pics and info. 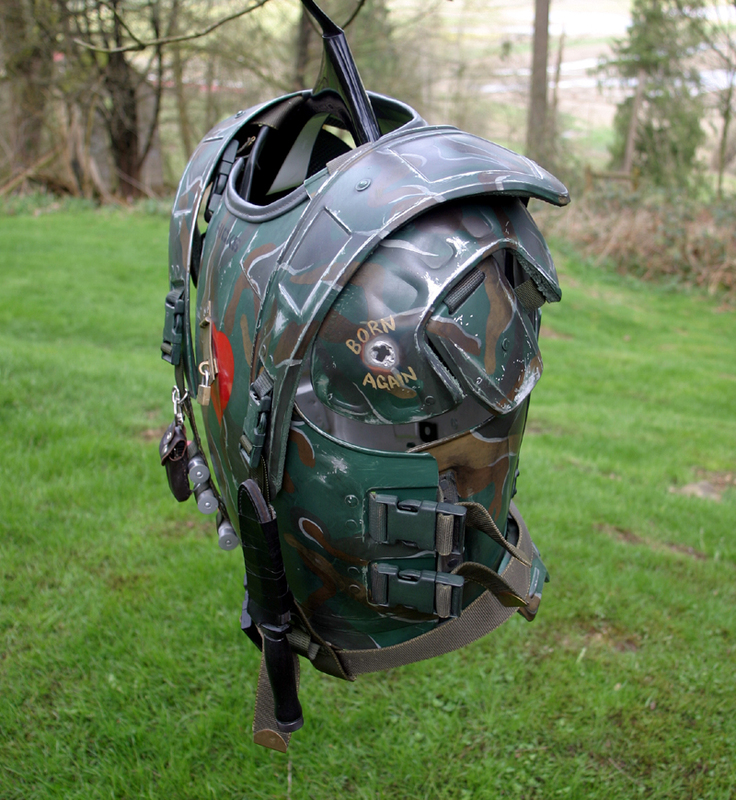 PS- the pic of Ferro's helmet is the actual screenused helmet in case anyone is wondering. Pic courtesy of member "Gio" (Alien Emotion) who currently owns it. Another one I forgot to post for hicks was the tattoo on his arm. Last edited by bigbisont on Tue Jan 07, 2014 3:28 pm, edited 1 time in total. I don't think it is an SSN, but might be part of his Marine service number. I like to say it is his "Vidfone" number for the laydeez. Nice thread! Have been thinking this for ages so its great that someone picked it up. Had a discussion with an artist way back planning to do a small PDF guide to the Marines but both were busy with other projects. So I encourage all guys here to continue and excavate details and post pics to complete it all, I know here is more on the forum. As for Hicks SSN I actually asked him at a con a few years back. He said that the prop department gave them hands free to "personalize" their outlooks so he took a grease pencil and wrote his SSN on his arm that he thought was cool. I interpreted as a flesh tag so one knows who the body belongs to in case of mutilation. - So now you can use it.. he said smiling. I said -Yeah later, and smiled back. He suddenly looked like a ghost that scared me a little and he hurriedly backed off. He probably thought I was a stalker and got second thoughts which felt a little strange. He also claim SSN during a magazine interview and I think it is also mentioned on one of the DVDs/BR's. As for continuing Marine personalization there is the Barbed wire neck tattoo, whose was it... Hudsons?? that has to be added (don't recall if a couple of dog tags were also in the tattoo)? The Eye on the Drakes Smartgun Eye piece must be added. Dietrichs Medic bag has a huge red cross painted on it. 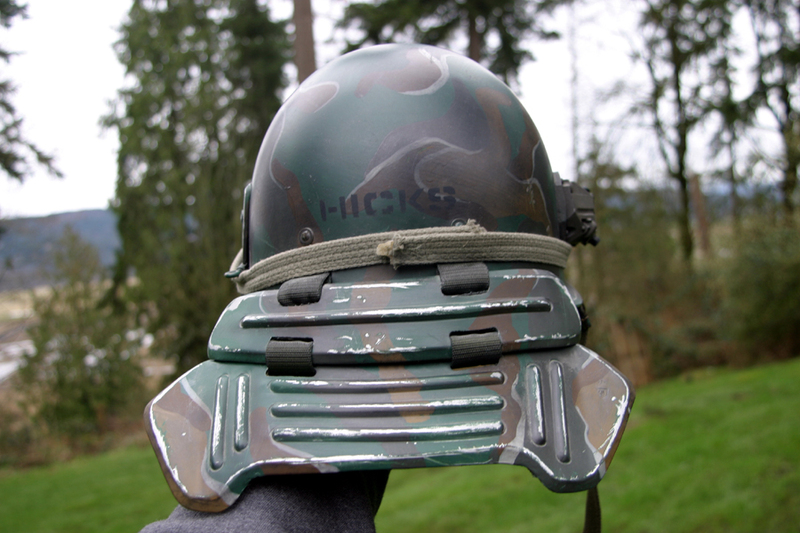 The Chinese signs on Hicks armor btw are deciphered in detail here somewhere. Some one with more time then me have to go through the archives. Could we list all the details in text for each character to get a more clear overview? In addition to the barbed wire Hudson also has a hinge tatooed on the inside of his left elbow joint. Well, not a "great" shot, as you can't see if dog tags are present on the bottom, but here is Hudson's "barb wire" tat. Considering that elbow is under bandages through most of the movie, it could be a tough pull to find a good shot of the elbow. I'll see what I can scrounge up! Hey Moosh, where was it you saw this? Im trying to grab an image to post, but after a dozen face images I dont see one under either eye. Try the one where Ripley says, "I hope you're right... I really do" and Vas stares back in chastised arrogance. Also, look at Vas's facial closeups when she's welding everything. Ssgt Burton found this picture of Hudson's hinge tattoo in another thread. Drake has a scar on his cheek (that Mark Rolston requested), and Gorman has a wedding band. Any other jewelry on folks? Was gonna post pics I just took with my digicam from the blu ray, will post them once the camera's battery has recharged. Vas' tattoo is barely visible and not shown at all in most publicity pics, maybe just done with mascara or something at the time? Hudson has a skull & crossbones at the bottom of his barbed wire necklace, seen in the pic just above. I grabbed my pics from the chinups scene after they wake from cryo sleep. Nice close shots of her face. ... and Gorman has a wedding band. Any other jewelry on folks? 'Bowski's wearing a plain gold ring on his wedding ring finger too. Drake's got more than one necklace on, including at least one metal chain. Will try to get a shot later. Awesome thread ! Great pics . Very useful . Or put in the Archive section, but for that I suggest all the pics are redone as attachments to the forum, so that in the future they don't disappear. Is that text on Hudson's medical patch thingies or a shadow from a raised section in the middle?